A very good short book that shows how the loss of life and destruction of WW1 commenced due to little more than a matter of pride and ego. It shows the human side of the often inept royal players. Nothing new on the last of the Romanovs, it has been covered in detail from every useful angle by earlier authors.The coverage of the assassination of Archduke Franz Ferdinand of Austria was well covered and not brushed over as is common.The laborious details of the war were not heaped on the reader, but mentioned only in expression of the personal effect it had on the various leaders.The layout and detail of the book is very good, with each page maintaining the reader’s interest. The absence of padding made it necessary to take in every word.The final line of the book repeats an emotional note written all those years ago by a distraught teenager, today we recognize it as the maxim for the lover of history. 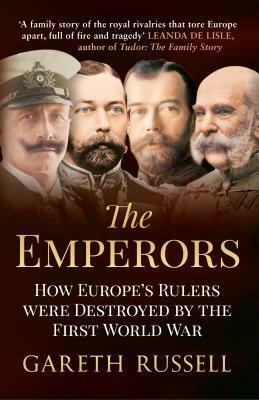 The front cover of British historian Gareth Russell's new book, "The Emperors: How Europe's Rulers Were Destroyed by the First World War" shows four men, rulers of countries involved in the Great War. All but one - Britain's King George V - were turned out of power at the war's end. One - Russia's Tsar Nicholas II - was murdered, along with his family, in the basement of a remote Russian house by revolutionary forces. The other two - Germany's Kaiser Wilhelm and Austria's Emperor Karl (who had succeeded Emperor Franz Joseph in 1916) - escaped with their lives and died in exile. Russell has written an extremely readable - though short - book about these three men and their influences in both their own countries and in the greater world.The Great War began 100 years ago. It was sparked by the assassination of Franz Joseph's heir, Archduke Franz Ferdinand, in Sarajevo, in June, 1914. Europe had not seen large, full-scale warfare since the defeat of Napoleon, almost 100 years previous. Although there had been some short, local wars - France and Germany in 1870, for instance - the idea of a continent-wide warfare was thought a thing of the past. The economies of the countries were relatively booming; even in Russia which had come under some "gentle" reforms for the serf-class. Most of the major countries were in alliances - some had been made 50 years before - and there was a vague awareness that wide-spread warfare, as a result of these alliances, was a possibility. For six weeks, diplomats of France, Britain, Germany, Austria-Hungary, and Russia, worked behind the scenes to try to keep the peace. Those attempts failed and war began in August, 1914. Four long, bloody years later, the war ended, with millions dead or injured, and northeastern France and Flanders left in tatters. It also ended the "empires" of Germany, Austria, and Russia.Gareth Russell does an excellent job of looking behind the scenes at the reigns of Wilhelm, Nicholas, and Franz Joseph and Karl. He uses original sources - listed in the end of the book - and he gives the reader the sense of who these men were and how they ruled. The "personalization" is an important component in figuring out their places in history, and includes examining the influence their wives and families on these men.Russell's book is just one of the many excellent histories that have been released in the past few years about the Great War. He examines not only the pre-war worlds of these rulers, but the post-war lives, too. If you're a WW1 buff, you'll enjoy this book. Most of the time when we study the Great War, The War to End All Wars, World War I, we look at series of events, and the the people involved are moved around as pawns. All the war's a stage, and the people merely players. This is the first book I've read that told me more about the rulers of the time as actual people, and I was blown away by how little I'd known them. It was both shocking and heartbreaking to read about the humanity and heroism of some of the so-called despots, as they struggled to bring about better lives for their people. Some tried to end the war early, to prevent the outbreak of war at all. Although the main rulers the author focused on were in the Central Powers, I could not set them as the villains of the set piece, even though that's how contemporary history has taught us to view them. The author ends with an epilogue that is surprisingly (or perhaps, only surprising in the democracy-is-the-only-way world we now live in) pro-monarchy. The author argues that whatever the sins of the reigning monarchies, certainly Austria, Germany and Russia were done no favors by the governments that arouse after the rulers abdicated. While I don't know that I agree with his conclusions, it's a refreshingly different viewpoint, and I'll support anyone who refers to President Wilson's behavior as "criminally imbecilic." The only reason it took me this long to finish this book was because of a major project at work, otherwise I would have finished reading it much faster. What a great read! This is am excellent book for anyone with an interest in the years and events leading up to WWI and the powers that toppled during the War. I highly recommend this to IB students taking 20th Century World Topics. My knowledge of this brink-of-war period is quite sketchy, so I especially appreciated Russell's clear prose and his thorough yet concise story of the destruction of European monarchies.